COOKEVILLE – A new adult co-ed kickball league is ready to kick off. Presented by Cookeville Leisure Services, the inaugural season will be played on Tuesdays and Thursdays beginning Sept. 25, with games at 6, 7 and 8 p.m. each evening at the Cane Creek SportsPlex, 2200 W. Jackson St. Teams will have a seven-game schedule. “Those who attended our organizational meeting were anxious to recall their youth kickball experiences and put their skills to a test in the form of an adult league,” Jim Crea, athletic superintendent, said. Jordan Allen, who plans to join the league, said she’s “super excited” about it. Randy Spurlock, another interested player, agreed. Teams must register and submit rosters by Sept. 18 at the SportsPlex office between 8 a.m. and 4:30 p.m. Monday or Tuesday. The fee is $150. A coaches’ meeting will be held Sept. 20 at 6 p.m. at the SportsPlex. Teams must include at least 10 players, with no more than seven men and no fewer than three women on the playing field. The league will follow adult softball rules but also include kickball regulations specified by Leisure Services. “Leisure Services is proud to offer another program to accommodate the community’s recreational needs,” Crea said. For more information, call 931-520-5224. 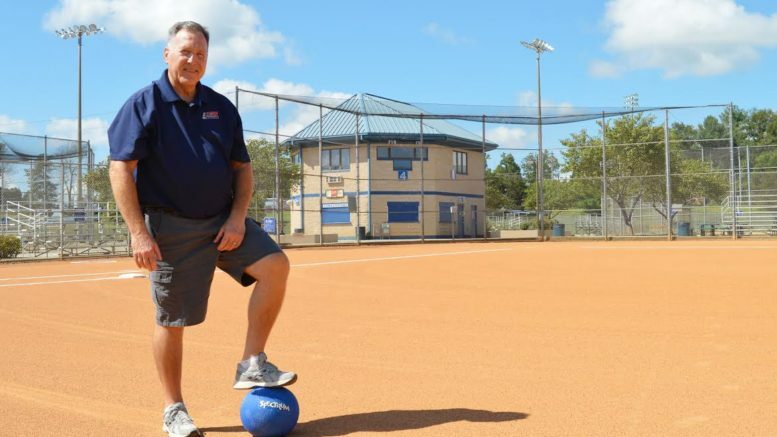 Randy Spurlock gears up for Cookeville Leisure Services’ new adult kickball league at the Cane Creek SportsPlex.